A commercial jetliner has overshot a runway and landed in a lagoon off Chuuk International Airport in Micronesia around 9:30 a.m., according to airport officials. Photos of the airliner floating in the sea have begun circulating on social media. 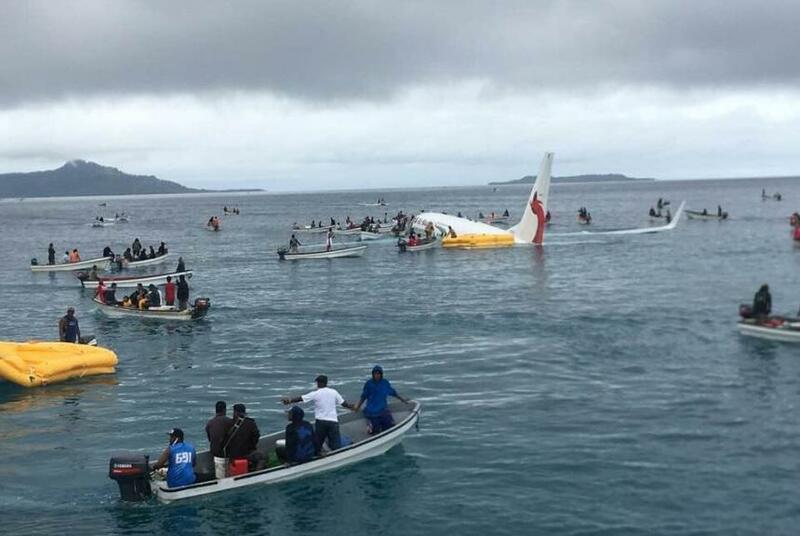 The jet has been identified as an Air Niugini flight from Papua New Guinea and it is currently sitting in shallow water just off the coast of Micronesia. Some remarkable footage was shared on Twitter from aboard one of the rescue rafts. Early reports say that all 35 passengers have been accounted for, including the pilot and co-pilot. Of the 35 passengers and 12 crew onboard flight ANG73, none of them suffered serious injuries. The cause of the crash is going to be investigated and it is unknown what caused the plane to overshoot the runway. Chuuk airport manager Jimmy Emilio said, "The plane crashed in the lagoon, about 160 yards away from the runway. Right now we don't really know what happened. Investigations will start the earliest tomorrow, but for now, operations are starting again as usual in the airport." Emilio confirmed all of those aboard the Boeing 737-800 jet were taken to the hospital to be checked, he said a few may have sustained some "minor injuries". A passenger who has flown into the Chuuk International Airport said the runway is 6,013 feet long which is relatively short. Ethan Klapper shared a video from his own flight showing just how short the runway is and how hard the plane had to break in order to come to a halt in time. The Boeing 737-800 was flying from the island of Pohnpei in Micronesia to Port Moresby, the capital of Papua New Guinea. The flight had a scheduled stop at Micronesia's Weno island on the way to the capital city. A witness to the crash named Mathew Colson is a missionary living in Chuuk who runs a local radio station. After visiting the hospital, Colson said were coming in that people were arriving at the hospital with broken legs and at least one person with a broken arm. The airport's manager Jimmy Emilio said, "Somebody has to look into that and let us know. So far, we don't know why they went down." The plane sunk and was fully submerged within an hour of the crash but all passengers and crew were successfully evacuated. Bill Jaynes of The Kaselehlie Press was a passenger aboard Flight 73 and he said he believes the plane hit a retaining wall and bounced back into the lagoon. "It's just surreal. I thought we landed hard until I looked over and saw a hole in the side of the plane and water was coming in, and I thought, well, this is not like the way it's supposed to happen," Jaynes said. "We came in low, we came in very low. Unfortunately, the flight attendants panicked and started yelling, and I was trying to be calm and help as best as I could. That's the only scenario I can imagine. But we ended up back away from the end of the retaining wall." Colson added that it was raining at the time of the crash and said the plane probably didn't stop in time. "We’ll have to wait for the investigation to be completed, but they probably didn’t stop fast enough and landed over the edge and in the water," Colson said.